During the second quarter of the wage income was a bit higher as normal, because in May and in June I did some overtime work. Expenditure in June was much higher than my normal. June, the cost includes the advance payment for a future journey, so it will explain a little of my higher than normal expenditure. However, it is clear to see that my expenses are beginning to grow and the direction should be able to change down. 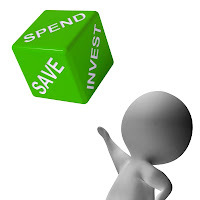 My goal is to save about half of my wage income and invest it. During the second quarter I'm a behind on my target, my saving rate of wage income was 41.98%. When I take into account also the dividend income, my savings rate rises to 64.74%. The second quarter was in line with my expectations, due to the high dividend income in April. I am pleased with the second quarter results, dividend income covered all my expenses. My expenses were an average of 1610 Euros and my salary was an average 2760 Euros per month. As you can see, during the first part of year, I was able to save 41.68% of my wage income, which is well below my target. Of the total income my savings rate in the first half of the year was 58.40%. Thanks to the excellent dividend income in the second quarter, almost 70 percent of my expenses I was able to cover with the dividend income during the first half of the year. As you can see, during the first half of the year my dividend income grew only about 8 per cent, even though I made several acquisitions over the past year. The reason for such a small increase is dividend cuts, which was announced late last year. (Summary of Dividend Cuts) Wage income compared to last year were significantly higher, for the simple reason that I did more overtime work. Due to the high increase in spending, my savings to wage income went down 20.8%, it was only 41.98% for the first six months. Of my expenses, dividend income accounted for about 18 percent less than the year before, so the journey towards financial independence seems to be rather more distant than closer. I look forward to what the next quarter will look like. In the third quarter dividend income will be at the lowest. Wage income should be close to normal (2k EUR per month) and expenditure hopefully a little less than at the beginning of the year, although the vacation (5 weeks) is usually a period when money is spent more as at other times. Keep it up Hawk. You're saving tons of cash. Great job. Nothing wrong with some over time work bud while you can. It'll pay off big time later. I know it will. Thanks for sharing and best of luck. Cheers bro. Hey, this is a great month, saving over 60% is a fantastic result :) Your dividends are steadily going up, 10% is a great increase considering how much you're getting. Keep it up. You are doing a Great job! Especially your spending site is really low. Keep it up!